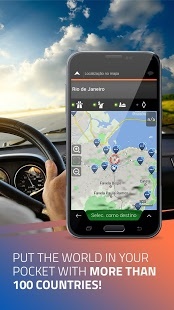 iGO Navigation Join millions of travelers around the world and take the journeys that matter. iGO Navigation is an app created by NNG Software Developing and Commercial LLC. (whose official website is http://www.igonavigation.com/contact). iGO Navigation has a rating of 3.9 on the Play Store, with 5393 votes. Similar apps are: 7ways (by Navikey), Sygic Car Navigation (by Sygic. ), Speed Cameras by Sygic (by Sygic. ), Soviet Military Maps Free (by ATLOGIS Geoinformatics GmbH & Co. KG), Navmii, Oi Mapas (by NDrive Navigation Systems, SA), OsmAnd, Maps and navigation (by We love maps), GPS Navigation BE-ON-ROAD (by Bzing s.r.o. ), HERE WeGo (by HERE Apps LLC), Waze. iGO Navigation is currently available in the following countries: Peru, Switzerland, Romania, Israel, Turkey, Thailand, Germany, Japan, Netherlands, Denmark, Slovakia, Greece, Ukraine, United Arab Emirates, Poland, Estonia, Chile, Australia, Austria, Singapore, Indonesia, Czech Republic, South Korea, Colombia, Croatia, United Kingdom, France, Serbia, Sweden, Latvia, Lithuania, Norway, Finland, Hungary, Belgium, Hong Kong, Spain, Philippines, Taiwan, Malaysia, Russia, Bulgaria, India, Canada, Mexico, South Africa, Italy, Brazil, Portugal, Argentina, Saudi Arabia, United States, New Zealand, Egypt, Vietnam. Ride with Uber for fast, reliable rides that are affordable and available 24/7. The World’s Most Advanced Navigation app, trusted by 150 million drivers. Lovely off-line navigation for your life! Are you ready look beyond the horizon? The World's Most Installed Offline Navigation App, Now For In-dash Receivers. Speed Cameras by Sygic with speed camera alerts, traffic, and speed limits.